Your tears, which keep your eyes moist, are a mixture of three layers – oils (lipid layer), water (aqueous layer) and mucus. The oils are on the outside and are made by the meibomian glands in your eyelid. These oils help to stop the watery layer underneath from evaporating too quickly. 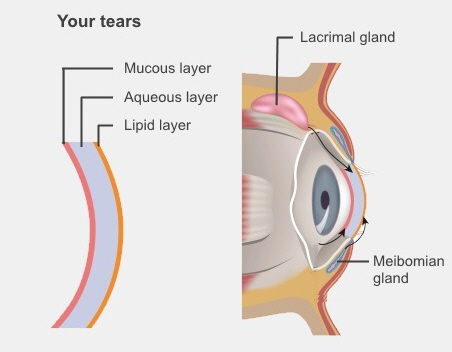 The tear ducts (lacrimal gland) in your upper eyelids make the middle water layer. This keeps your eyes moist and washes out dust or anything else that gets in your eyes. The cells on the surface of your eyes (conjunctiva) make a mucus, which helps the watery layer to stick and spread over your eyes. being very sensitive to light. Many different things can contribute to having dry eyes. As we get older we make fewer tears. Women are also more likely to get dry eyes because of the hormonal changes that happen with their periods, pregnancy, breastfeeding, and menopause. Using your eyes for fine tasks such as reading for a long time can contribute. We blink less when we're reading a computer screen, when reading print, or when we're watching TV. Dry or windy climates, higher temperatures, pollution, and smoking can all make your eyes dry. These include blepharitis, ectropion (when your eyelid turns out, which can happen as you get older), a problem with your meibomian glands, refractive surgery (especially LASIK), pterygium or pinguecula, an eye injury, or abnormal blinking. As well, wearing contact lenses increases your risk of getting dry eyes. These include autoimmune and connective tissue diseases such as Stevens-Johnson and Sjögren's syndrome, hepatitis C, HIV and Aids, sarcoidosis, diabetes, hormone deficiency, and rosacea. If you don't eat enough omega-3 fatty acids and too many omega-6 fatty acids you can get dry eyes. Certain medications such as chemotherapy, diuretics, antidepressants, antihistamines, hormone replacement therapy, beta blockers, and oral isotretinoin for acne can cause dry eyes. EyeSmart – What is dry eye? Several web pages explaining what causes dry eyes, its symptoms, who is at risk, diagnosis and treatment. On the next page: How are dry eyes diagnosed?